Ready. Set. Write! #RSWrite – 10th update! Disclaimer: I’m in Europe this week, so I might be slow making my way through the blogs. Sorry about that, but I’ll try to do a bit of cheering each day! IMPORTANT REMINDER –> The last week of Ready. Set. Write! (8-24 – 8-31) we’ll be holding a fun virtual event called Manuscripts and Manicures. We’ll each be painting our nails in a way that reflects our current WiP, then posting a photo of our manicure creations. Finish drafting this manuscript. –> ALMOST. I wrote about 5000 words last week which isn’t too bad, since we left for Europe on Tuesday. Finalize its blurb for the cover reveal. –> NOPE. Send the feedback on a wonderful manuscript I’m beta reading. So. Good. So so so good! –> YES (and this book is simply AMAZING) I finished reading it on the plane from DC to Frankfurt and I couldn’t put it down. Loved. It. Finish drafting. I’m going to write at least 1000 words each day. And he kisses me. Tender and passionate. Desperate and hopeful. I forget myself into his lips. Into the way he tastes, the way my entire body reacts to his, the way his arms tighten around my waist. “What do you think you’re doing?” My father’s voice booms. That a scene unlocked itself. Don’t forget to link to your update below! The winner of Alison’s wonderful giveaway package is Crystal Schubert 🙂 Congrats Crystal! And it’s giveaway time again! This time the lovely package has been prepared by the wonderful Katy! “If You Obey All the Rules You Miss All the Fun” journal, floral mini sticky note pad, lined floral note pad, Jelly Bellies, starry pencil pouch, Honey Pear hand cream, Lavender Lemonade candle, peppermint mints, various washi tapes, Eos Strawberry Sorbet lip balm, writerly quote pencils, Bigelow Vanilla Chai Tea, and Twizzlers. Previous postReady. Set. Write! 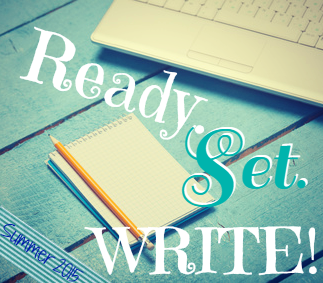 #RSWrite – 9th update! Next postReady. Set. Write! #RSWrite – 2015 Wrap-up! OMG Europe sounds amazing! Have fun for the rest of us! You did great last week. In another country and still did 5K counts as a win in my book! Working on your vacation. Dedication for sure. 5,000 words is particularly brilliant considering you were travelling! Yes, you’re definitely dedicated to carry on writing! Have a great holiday, hope your manuscript lets you finish drafting it nice and quickly so you can relax! And that snippet! Haha, poor characters, thwarted right when it gets fun! Love it when a scene unlocks itself! Yay! And congrats on all the wordage, despite the vacation! Hope you have fun in Germany, Elodie! And good luck this week with your goals! Wow, getting writing done and going to Europe? That’s impressive! Have fun!!! I hope you have all the fun in Europe. That sounds like such a great way to end the summer. Good luck with writing and traveling this week! Enjoy Europe! Maybe you can finish your writing in a cafe overlooking the Seine. So amazing. Have fun! Great job getting the words down despite the travel. Best of luck finishing the draft! Have a fantastic time in Europe. I wouldn’t be able to do any work while abroad, so I wish you much luck! Gosh, do we ever finalize a blurb until it’s on the book? I don’t think so. Nice word count! Keep at it. Hooray for all your progress, and your intention to both soak up Europe and make progress!